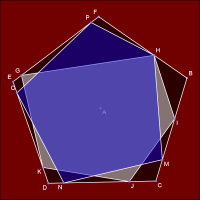 Two pentagons are nested within a third, regular pentagon (ABCDE). They are each defined by a point on each side of ABCDE; these points are proportional along their sides at functions of t. Determine the function of t that represents the proportionality of each point. Notice that both pentagons are congruent to ABCDE when t = 0 and t = 1.